how to ensure you have a supply of safe water. During the bushcraft weekend you'll use your knife and other tools to make some very useful items, developing your tool use skills. You'll sleep in your shelter. You will then get your fire going again in the morning and cook your breakfast on it. It doesn't have to be a weekend you can also book two consecutive days during the week. There is plenty of food growing wild around us. 7,000 years ago, our ancestors started growing their own food but before that we hunted wild animals and picked wild plants to eat. It was really important to know what was edible and what was poisonous; it could be a matter of life or death! This is an introductory activity to a very big subject we’ll get you off on the right foot. We’ll be out in the field looking at identification, discussing preparation and some tasting. Shelter is essential; it protects us from the weather, keeps us warm and dry and is psychologically important for morale. You’ll learn how to make a lean-to cold weather shelter that maximises the benefit you get from the warmth of your fire. Fire is one of the oldest skills known to mankind; it is thought that our evolution as an intelligent, dominant species was helped greatly by our ability to cook raw food. Firecraft is a central survival skill; it warms us, it dries us, it makes water safe to drink, it cooks our food, it lifts morale. You'll sleep in your shelter. You’ll learn how to manage the fire from start to finish to minimise impact on the surroundings. People often say food tastes better cooked outdoors over an open fire. You’ll cook bread cakes, smoke fish (optional), make soup and bake food in the embers as well as have a brew up. We’ll add a few seasonal wild ingredients as available. You'll learn how to sharpen knives and axes and undertake a number of useful projects that will develop your skills. Surface water found in Britain is rarely safe to drink. You’ll learn a number of different ways to collect water and process it for safe use. Cost: £150 per person for two people, £50 per additional group member. Individual one-to-one training available at £300. There is an additional overnight fee if staying at Harehope Quarry of £6 per person. Booking: Ring or email to book a weekend that suits you; tel. 01388 529154 or email enquiries@natureholiday.co.uk then fill in and return the booking form (by email or post) and click on the button below to pay online. Further information: Minimum group size two; maximum 12. Participants should be 16 or over. Bring a packed lunch on Saturday. Price doesn't include food ingredients which you will need to bring yourself. 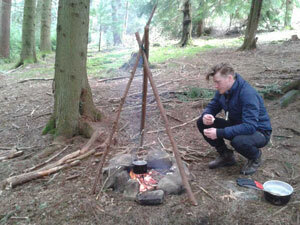 The bushcraft weekend activity leader is qualified through the Institute for Outdoor Learning to teach bushcrafts to groups and has been involved in bushcrafts and woodland skills for over thirty years. He is DBS cleared.